When Canon's CEO prognosticated that the camera market could shrink by half in two years, some questioned whether things were really that bad. 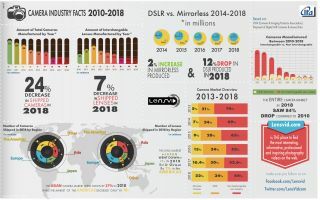 According to the latest annual report by LensVid, however, things are exactly that bad, with an astonishing 84% drop in the camera market in just 8 years. In 2010, the height of the industry, 121 million cameras were produced. In 2018, however, that number had eroded to just 19 million. The website's yearly report contains more sobering statistics. There was a 24% decrease in cameras shipped from 2017 to 2018, with a 7% drop in shipped lenses. And while the decline of DSLR production continued, dropping 12%, it was nowhere near balanced out by the growth of mirrorless, which only increased by 2%. While the number of cameras produced and sold dropped drastically, however, the amount of money that was spent on them actually went up. "In 2018 the number of cameras sold went down as we have mentioned by about 24% compared to the previous year – however the amount of money spent worldwide on these far fewer cameras only went down by 4.5% compared to 2017 and even more interestingly while in 2018 we purchased almost 7% less lenses than the year before – we spent 5% more money on buying them." We now face a perilous position where manufacturers are selling less cameras and lenses, so they are having to charge more for them. Which starts a vicious cycle, as more expensive gear means that less people will be inclined to buy cameras, which will further shrink the industry and cede more ground to smartphones. In short, don't expect new gear to get any cheaper – and true innovation, if it can still be afforded, may be in short supply. The best 50mm lens in 2019: Which 'standard prime' is the right one for you?